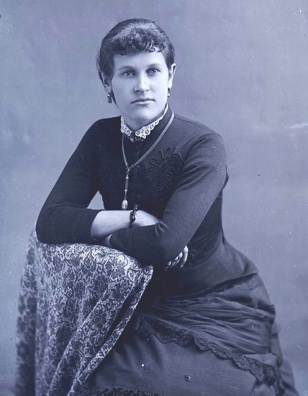 Ida Hermina Jockmann was born on 3 May 1869 in Schleswig, Manitowoc County, Wisconsin. She married Peter Gerlach, son of Wilhelm Gerlach and Charlotte Weigel, on 17 May 1887 in Kiel, Manitowoc County, Wisconsin, at the Reformed Church. Ida Hermina Jockmann became a widow at the 31 July 1912 death of her husband Peter Gerlach. She married William Schoedel on 30 April 1922 in Manitowoc County, Wisconsin. Ida Hermina Jockmann became a widow at the 14 July 1955 death of her husband William Schoedel. Ida Hermina Jockmann died on 31 August 1963 at age 94 in Wild Rose, Waushara County, Wisconsin. The following appeared on circa 5 September 1963 in a local newspaper: Funeral services for Mrs. Ida Gerlach Schoedel, 94, former Kiel and West Bend resident, who died Saturday at Wild Rose, Wis., were Tuesday afternoon at Meiselwitz Funeral Home, Kiel. The Rev. Vernon E. Jaberg of St. Peter United Church of Christ, Kiel, officiated and burial was in Kiel Cemetery. /P/ Mrs. Schoedel, nee Ida Hermina Jochmann, was born May 3, 1869, in Manitowoc county, daughter of the late Karl and Christina Lieske Jochmann. May 17, 1887, she was married to Peter Gerlach, who died in July, 1912. April 30, 1922 she was married to William Schoedel of Kiel, who preceded her in death July 14, 1955. /P/ Survivors are two sisters, Mrs. Bertha Keppler of Wild Rose and Mrs. Lena Krueger, of Sheboygan, a grandson and two great grandchildren. Two sons, Arvin and Melvin Gerlach, also preceded her in death.